MUAC athletes returned to competition after several weeks of training and exam study for Round 5 of AV Shield at Coburg. The first visit to the long bends of Coburg saw some impressive performances. Paul Kennedy extended his unbeaten ‘run’ to five, winning the 3000m walk. Lauren Jauncey is in top form at the moment, winning the 200m in 24.88. 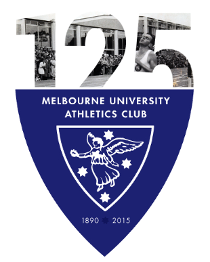 MUAC took out the 400m hurdles double with Ross Dennis returning from months of secret training for a win and Jacquie Sharples running a national qualifying time to win the women’s race. The Women’s Division 2 relay team of Erica Lane, Carmen Deane, Steph Pearce and Lauren Parisi comfortably won their 4 x 400m race. 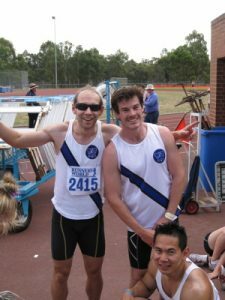 The MUAC Event of the Round was the hammer with Joe Cosgrave and Sami de Marchi making their debuts at the discipline. On a hot day in Coburg the pick of the day from the canteen was overwhelmingly icy poles, rather than the normally favoured dim sims. Round 6 sees MUAC venturing back to Meadowglen as we approach the half way point of the season. Results and ladders coming soon.